After a bit of experimenting and sorting the right colours etc I have finished my first stand of fallschirmjagers for FOW. 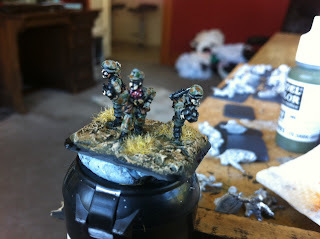 Need to get a crack on as my regualr gaming mate, Bruce, has nearly painted a company of Brits. We are going to be using them for the IABSM (I ain't been shot Mum) ruleset by Toofatlardies (see link below) plus I will be using mine for FOW. The commander has a red spotted scarf around his neck. I have to say I enjoy painting 15mm so very quick to do and when done will look great.